Elvis never recorded a Roy Orbison song, as he did not believe he could better. The closest he came was one line of ‘Running Scared’ while recording ‘Tomorrow Never Comes’ for his classic Elvis Country LP in June 1970. Although legend has it that Roy turned up at the gates to Graceland with a song he has written for Elvis, ‘Only The Lonely’, however Elvis was not home and Roy went on to record the song which was his first smash hit. 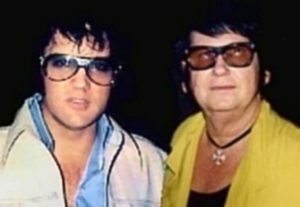 In 1979 Roy recorded a tribute song to Elvis, ‘Hound Dog Man’. Bill Haley was born July 6, 1925 in Michigan, as William John Clifton Haley. Died February 9, 1981 (aged 55) Harlingen, Texas. In 1952, the Saddlemen were renamed Bill Haley with Haley’s Comets (inspired by the supposedly official pronunciation of Halley’s Comet, a name suggested by WPWA radio station program. In 1953, a song called “Rock Around the Clock” was recorded by Haley. Initially, it was relatively successful, peaking at no. 23 on the Billboard pop singles chart . A month later it became a #1 Hit Song. Haley soon had another worldwide hit with “Shake, Rattle and Roll”, which went on to sell a million copies and was the first ever rock ‘n’ roll song to enter the British singles charts in December 1954, becoming a Gold Record. He retained elements of the original (which was slow blues), but sped it up with some country music aspects into the song (specifically, Western swing) and changed up the lyrics. Haley and his band were important in launching the music known as “Rock and Roll” to a wider audience after a period of it being considered an underground genre. 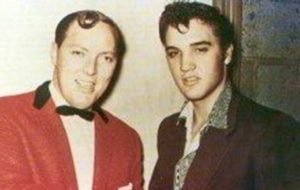 Taken in Germany 1958 Elvis visiting Bill Haley backstage. 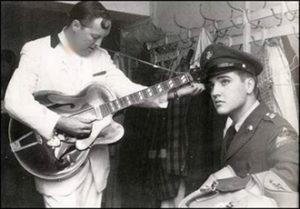 Haley was on a European tour at the time when Elvis was in the Army.